I tried add and test this examples in my Dynamics CRM 2011 Online. Works property when i download the entire solution and Import to my CRM. The tab Group and Button appears in my Ribbon. But now i want to delete this Button, i tried delete the solution but the Ribbons continue with the Custom Button i was created. How i can back my Ribbon to how they was before ??? tks and sure for my English. I tried to add and test these examples on my 2011 Dynamics CRM Online. It worked properly when I downloaded the entire solution and Import to my CRM. The Group tab and button appear on my ribbon. But now I want to delete this button, I tried deleting the solution, but the ribbon has continued with the custom button I created. How can I return my ribbon as it was before? 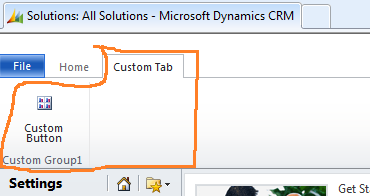 Please download the solution file from this link and reimport it this removes the Custom tab as well as the custom button which came up after my solution installation. Ok, I’ve tried this every way from Sunday and can’t get it to work. I’ve literally cut and pasted your code into the appropriate 3 sections. I get an error that say “The element ‘Group’ has incomplete content.”, but the Schema validates fine in Visual Studio. How can we do it in CRM 2013. I tried as same as your are showing here but it does not display any more. Could you give me some instruction? Very helpful your blog.